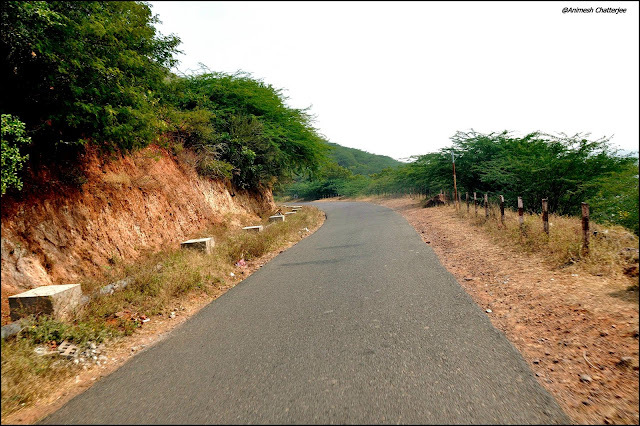 Ever since we[Me and my wife ] completed Srisailam trip, we gained more confidence on biking. Long drive on my beloved pulsar180. During last December,2014 travel ghost had drove us crazy about a new capital of Andhra Pradesh -Vijayawada. The name of the city translates to ‘place of victory’.It is home to the region’s largest railway junction. As per mythology ,Arjuna was blessed by Lord Shiva at the top of the Indrakeeladri Hill and after that Arjuna created Vijayawada. According to another myth, Goddess Durga rested here after killed a demon and that is why the place got its name. We heard that the road was good. We started on a sunny morning to venture Vijayawada. Since we were in motorcycle,we could not opt for Outer Ring Road.We had to take the route inside Hyderabad city. In the morning that too very cold,we started. The road was empty. While going,we crossed one more biker ,with all covered with travel gears with a red flag. I felt there might be crazy enthusiastic guys like us, still existing in Hyderabad. We were very happy to see this dude. We stopped for our breakfast in a road side dhaba,the same dude arrived there. He also ordered for dosa. Being curious I went ahead and saw this guy. To my surprise he was an elderly guy aged around 70+ heading towards Vijayawada. 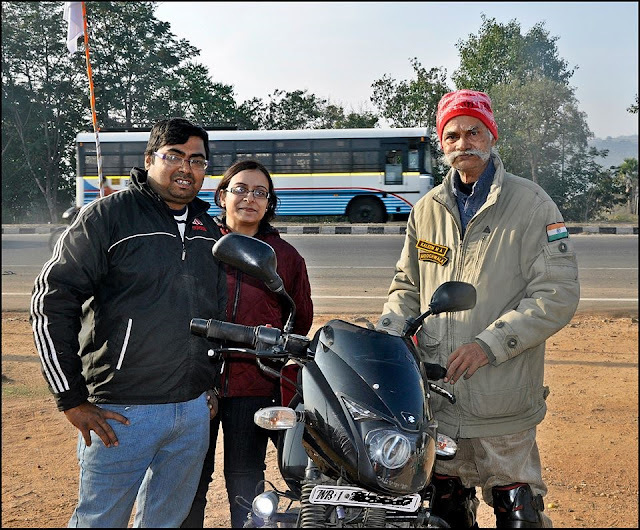 Upon talking we came to know he was none but our Kaleem Ma(sir) [Xbhp lead]. He said that he was travelling to Hoogly, a district in West Bengal. He was extremely glad to see us going in motorbike with full gears.After Dosa and hot tea we headed towards Chottuppal.Thanks to NHAI and Vijayawada Highway specialists. The street was extremely decent. We kept up a consistent 70KM speed. We halted for a roadside dhaba close Chotuppal for brisk tea. My bike additionally was searching for some rest. Post that we went to Suryapet. At that point we ceased at Kodad for some food.Pulsar was pulling 70+KM dependably. Street was great.Just before Kondapally we refueled our bike. We came to Vijayawada at around 2PM. We had a booking in spending inn called Executive Inn. We took some rest. Post lunch we went to PVP shopping center . KFC and hot espresso from barista filled our heart with joy. We came to inn for supper. The lodging did not have any kitchen offices but rather masterminded sustenance for us. The andhra supper was excessively great. Next day we went to Narasimha Temple,top of a hill.The way was too good.Ghat road.The view from temple was very good.Then we headed towards Mangalagiri town for famous cotton bazar . On the off chance that you knew local people, you could design a trek in the connecting hills . Mangala giri city was decent and clean. Streets were really perfect and open. Approach to Sri Narasimha swamy temple was great and appreciated the adventure.We could drive till the begining of the temple.We parked our bike just outside of the Temple. The temple had a goouram looks like Mangalore temples(Dravidian engineering).Vision from the temple slope was extremely decent. Mangala giri town perceivability from the slope was huge.The were two symbols of the Lord. One on the left side in a crouching from and in Kesar shading while the fundamental god was positioned on our right side which was secured with a Gold Plated Face of the Narasimha Swamy!! Local claimed to fame that the ruler Narasimha swami icon would open mouth and when pour jaggary blended water of 1 ltr . we had to get back for this. The main temple was named after “Panakam” as the Theertham that they offered in this Temple was as “Panakam”. The special piece of this Theertham was that when this was offered to the Lord, he just expended half of it while the rest was offered back to the fans!! Its a noteworthy temple that went back the whole distance to “Mahabaratha” time where the Pandavas amid their 12 years of outcast visited this temple to look for Lord Narasimha’s gifts!!! The city was popular for the panaga narashima temple on the little slope, lakshmi narashima temple in the foot slope and cotton sarees and wooden dolls at the footsteps. Shockingly we didn’t perceive any ants or flies humming over in spite of the floor being absorbed panakam. aficionados were seen bringing home panakam in containers. pleasant perspective of town and another arena coming up at Amaravati from temple. Subsequent to visiting the temple, we looked at the neighborhood cotton bazar for stuffs like sarees, dresses which are made of mangalagiri cotton. We had to bargain a little but got some fabulous sarees for our family. Museum was perfect and flawless and the specialists kept up well the museum.This historical center was opened at10am said to be closed at 5pm for all week days aside from friday.Amaravatin gallery was situated in focal point of the town amaravatin which was at separation of 35Km from the city Hunter or at separation of 45Km from the city Vijayawada.This historical center was run and kept up by Archology overview of India. Amravati declined from fifteenth hundreds of years to be rediscovered in late eighteenth century by McKenzie and later on different archeologists added to research and unearthings. The best of the workmanship pieces were removed to British exhibition hall, London while the rest was moved and housed in Chennai Museum. A couple of select pieces found their approach to remote exhibition halls of New York, Paris and Germany and some in New Delhi and Kolkata. Amravati gallery which was situated in the region of stays of the Mahachaitya and enormous statue of Buddha called Dhyan Buddha, had three exhibitions and a yard loaded with workmanship bits of various times. Among the showstoppers there were drum pieces portraying the stupa, in bas alleviation, standing life measure statue of Buddha, figures of second century BC including a Yakshi of Bharhut custom, full size standing elaborate bull and in the patio a model of the stupa and remade railing delineating life of Buddha. After little bit of shopping we went to Undavalli cave. The road was not so good. The tarmac was not in all the places. When we reached there,we found that there were no parking space for our bike. We had to park outside of the cave. There were no security.After reaching there,we found that this was a nice cave with lots of local idols and a huge idol of Lord Buddha.Govt was protecting this decaying Buddhist land for years.The arranging of the territory was done very pleasantly.It was a Buddhist legacy site,wonderfully kept up Garden and solid atmosphere.This was structured in 420-620 AD and this was developed in seventh century AD by ruler Vishnukundi.This caverns demonstrated the significance of Hinduism and models of Anantha padmanbha (Lord Vishnu) and master Narasimha. These caverns demonstrated the ability of artworks men who planned this figures in such a wonderful and appealing ways. 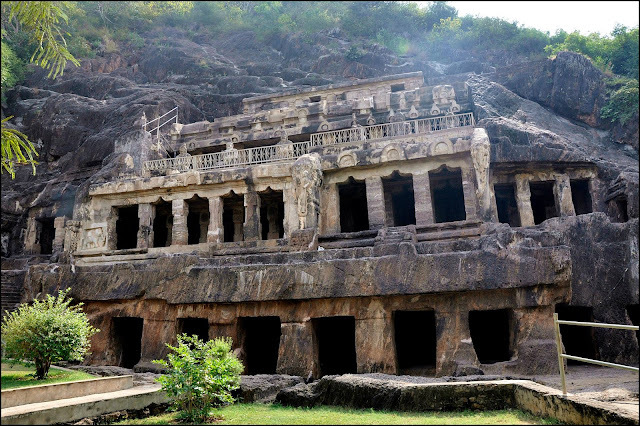 These caverns started as Jain spots of love from 420-620 AD and afterward Buddhists involved them and later Hindus. It was an amazing four story shake cut sanctuary. There were a few caverns and the best realized biggest one had four stories with an enormous reproduced statue of Vishnu in a leaning back stance, etched from a solitary square of stone inside the second floor.The caverns were encompassed by the green wide open. From the high slope over the cavern sitting above the Krishna River many fine examples of shake cut engineering could be seen. The yards and patio nurseries added sparkle to the appealing Caves.A predetermined number of Cave-cutting was obvious.It had awesome sculptures.The upper floors should be fenced as we felt that it was risky and slippery.With lot of efforts we were able to climb to the top.The view from above is a dining experience for the eyes with the greenery and the powerful Krishna streaming in the setting.The cavern complex was genuinely little, yet in any case intriguing (particularly the leaning back Vishnu).The gigantic icon of ruler Anantasayana’s statue in lyring stance, cut in a solitary stone was a treat to the eyes.Though it was a little mountain ,we got a great perspectives from the upper accounts of the encompassing wide open an enable a brief period to unwind and take this in!The icons and different models had stood the trial of time and had loads of history appended. The stone cut engineering had a magnificent creative look. Previous articleShall We Execute Our Automation Testcases in Random Order?? Nicenarration.it really motivating us to go. Great couple. Made for each other.